← Aging: A Gift or a Curse? Entrusting a loved one’s care to other people is something that many of us are reluctant to do. We’d rather learn and work together with family members in order to provide for the needs of an aging loved one. It’s not uncommon, however, to find perspectives shifting when the actual caregiving work needs to be done. Taking care of a person is serious business. It is hard work. It is emotionally and physically draining. Do you want to take a nap? Not right now, you can’t. Do you need to get some work done? No, because no one else can watch mom. This brings us to why, in this day and age, it is highly vital to work with home care agencies like Lowenhill Home Care Services when taking care of an elderly family member. Providing care to a loved one isn’t easy and requires considerable training. You definitely don’t want to get things wrong when dealing with an aging individual. Those critical few seconds of leaving your loved one in the bathroom because you forgot the towel? They could result in a fall your family could never come back from. Don’t put your loved ones in that kind of risk. Don’t think twice about working with a care professional. 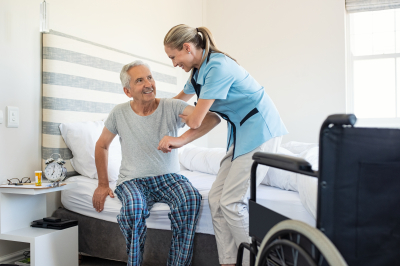 This brings us to why, in this day and age, it is highly vital to work with home care agencies like Lowenhill Home Care Services when taking care of an elderly family member. Providing care to a loved one isn’t easy and requires considerable training. You definitely don’t want to get things wrong when dealing with an aging individual. Those critical few seconds of leaving your loved one in the bathroom because you forgot the towel? They could result in a fall your family member could never come back from. Don’t put your loved ones in that kind of risk. Don’t think twice about working with a care professional. Working with a personal care attendant isn’t just for your loved one though but also for you. Caring for a person is a full-time job that doesn’t really leave time for anything else. That would not make for a healthy life for anyone. Relying on a qualified caregiver means you can continue working and paying the bills, and move forward with your life, all while being assured that your loved one is being cared for in the best possible way. Working with a personal care attendant gives the entire family peace of mind. We all lead busy lives these days. Also, we can’t just walk away from our other responsibilities no matter how much we want to. At the end of the day, we also need our livelihoods to be able to care for those dearest to us. Choose top-notch home care services and use their personal care solutions to provide a better life to your senior loved ones.